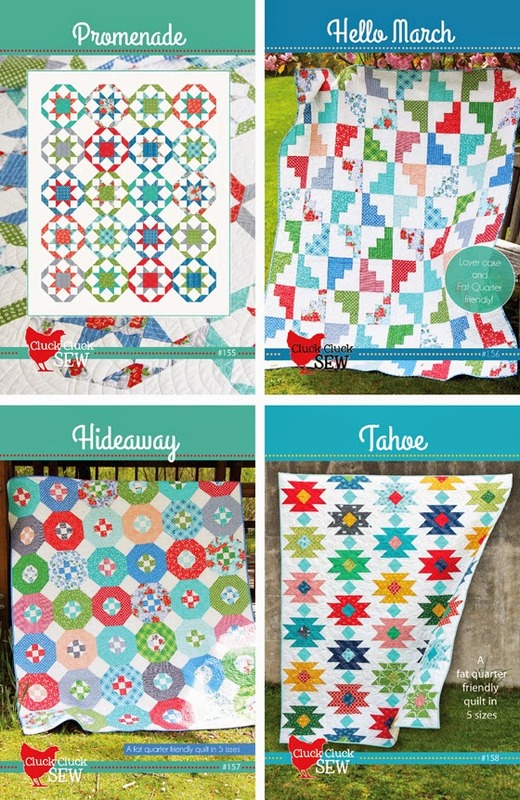 I have lots of quilts to share with you! I have four new patterns in the shop and available wholesale. Three of them are made with Hazel, and Tahoe was made with a mixture of fabrics from my stash. I’ll be sharing more about them and lots of photos in the next few days. The Lookbook for Hazel is done and it turned out so lovely if you want to take a sneak peek below (click the picture to go to the flip book). It’s so much work to get projects and photos done for the Lookbook, but also so rewarding to see it come together. I’ll be at Quilt Market this week…if you’re there come see me in the Windham Fabrics Booth #432, or go see my husband in booth #424 (he’s sooooo excited to spend his vacation at Quilt Market…ha!) and grab a button and say hi! I’ll be sharing all of my new quilts this week with scheduled posts, and I’ll take lots of market photos to share afterwards! Love your new fabric line – and I've already chosen two of your new patterns that I would love to make :)!! Enjoy your time at Quilt Market – so nice to hear you are 'both' involved – now that is support! The "look book" is amazing! And the buttons – wish I was going to market to see you (& your happy hubby) in action! Good luck – you'll knock their socks off! I love Hazel…..
Lovin' those buttons! I'm looking forward to seeing your new quilts! More wonderful patterns and look at those buttons!!! OMG!!! I love your new patterns!!! And your pins!!! I hope you have fun at market!!! Can't wait to see updates! I LOVE these new patterns!! I also would love to come to quilt market, as I am only an hour away from it. How do I get there if I am not a shop owner? Love the Tahoe pattern! And your buttons are too cute! Hope you and your husband have fun at quilt market! Oh my! you have done it again! where do you come up with these fabulous quilt designs! Love each one! I'm so proud of you Allison!!! Good luck at market and save me one of those fantastic pins to put in with my next pattern order! If I only were going to market, I'd definitely stop by! But the only stopping by ill be doing are the virtual visits I'm making! I'm sure you'll have a blast and be very successful. HI!! I would totally come see you if I were there…wanted to go sooo bad. I've never been! I love your new patterns and the Hazel fabric!!! Love love love it! Have fun! Absolutely love Promanade. Looking to purchase the pattern. Julie from Adelaide Australia. Congratulations on your Lookbook! It is awesome as is Hazel & the new patterns. Can't wait to see pictures of market! Tahoe looks amazing! Have fun!!! Loved the Lookbook, and love Hazel. The new patterns are terrific – I want them all! I did purchase the quilt pattern its lovely and I'm planning to make it sometime next year!!!! Many thanks Julie Beard from Adelaide Australia. Love all the quilts so pretty. Wish I could get back into quilting but just can't do it yet. Love the buttons a lot. Do you have any extras to send with orders? Have a great market experience.